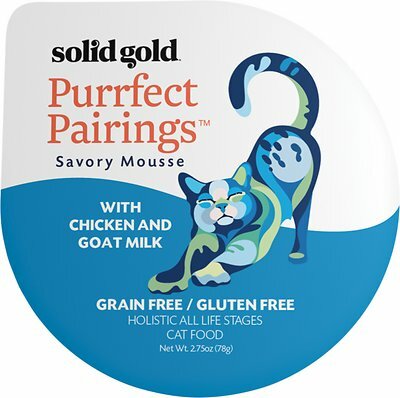 Make mealtime even more delightful with the Solid Gold Purrfect Pairings Savory Mousse with Chicken & Goat Milk Grain-Free Cat Food Cups. 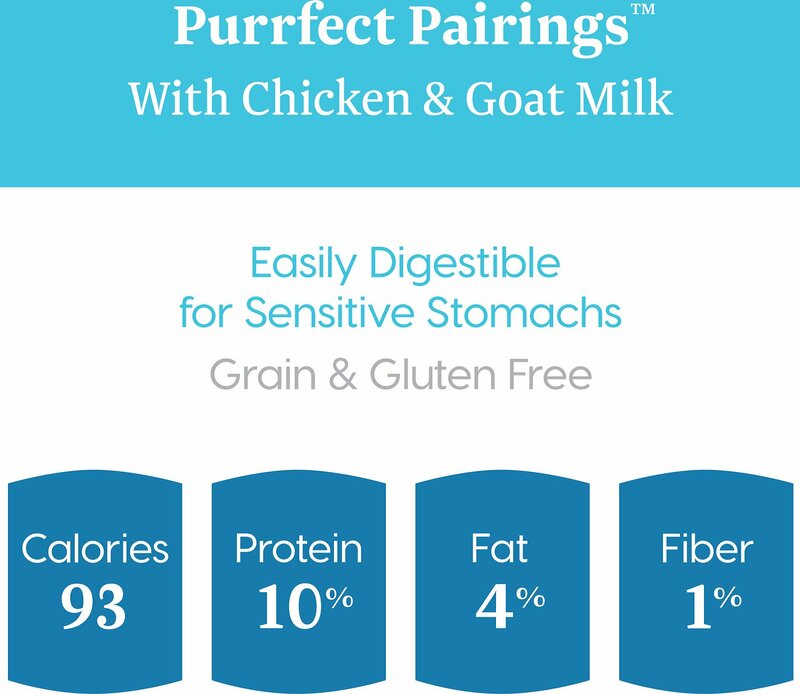 With real chicken in every bite, it provides the protein-rich, grain-free goodness your kitty thrives on—all in a deliciously light and airy mousse to satisfy even the pickiest eaters. The juicy formula is made with goat milk for an easy-to-digest and tasty source of nutrients, and includes vitamins, minerals, antioxidants and taurine for all-around, balanced nutrition. Best of all, each easy-to-open cup is a complete meal for your adult cat or kitten, on its own or mixed into dry food. Holistic formula with high-protein chicken in a lip-smacking and filling mousse made with wholesome goat milk. It’s the protein-centered diet that cats and kittens love, and the juicy mousse is perfect for finicky eaters. Provides all the essential amino acids, minerals, vitamins, antioxidants and taurine your kitty needs for overall health. The goat milk is a great source of easy-to-digest nutrients and helps provide much-needed daily hydration. 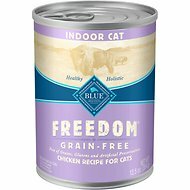 Comes in easy-to-open, perfect-portion cups that can be fed on their own or mixed into dry food, and contain no gluten or grains. Water Sufficient for Processing, Chicken, Tuna, Potato, Pea Protein, Goat Milk, Chicken Fat, Modified Tapioca Starch, Salt, Tricalcium Phosphate, Guar Gum, Potassium Chloride, Magnesium Sulfate, Choline Chloride, Sodium Bicarbonate, Iron Glycine Complex, Zinc Glycine Complex, Taurine, Vitamin E Supplement, Manganese Glycine Complex, Niacin Supplement, Copper Glycine Complex, Thiamine Mononitrate, Vitamin A Supplement, Sodium Selenite, Vitamin B12 Supplement, Pyridoxine Hydrochloride, Calcium Pantothenate, Riboflavin Supplement, Biotin Supplement, Vitamin D3 Supplement, Folic Acid, Potassium Iodide, Menadione Sodium Bisulfite Complex (Vitamin K3). Feeding amounts are guidelines and may vary. Adults: feed 2 bowls per 6 lbs of bodyweight per day. Kittens: feed up to 2 times the Adult amount. Provide fresh water for your cat at all times. Refrigerate after opening. 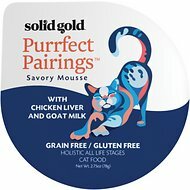 My cats are finicky with their wet food. When I feed them the mousse or the three layer they eat all that I give and still want more. And it is very gentle on my Sphinx’ belly. He has a sensitive tract that used to cause him all sorts of issues and allergies. I recommend this for all types of cats I have three different types total. 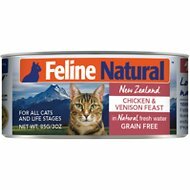 My cat HATES pate and I grabbed a can from a local pet store out of curiosity. He's extremely picky and will stop eating a food if he gets tired of it, so his go-to "I need to make you eat" foods were extremely unhealthy options (usually Fancy Feast). This is his new go-to! He will always eat either the chicken or turkey options. I even mix dry kibble with it and he's cleaning his bowl! Such a better long-term option than the crap he had before. My ten week litter mate kittens really go for this food. 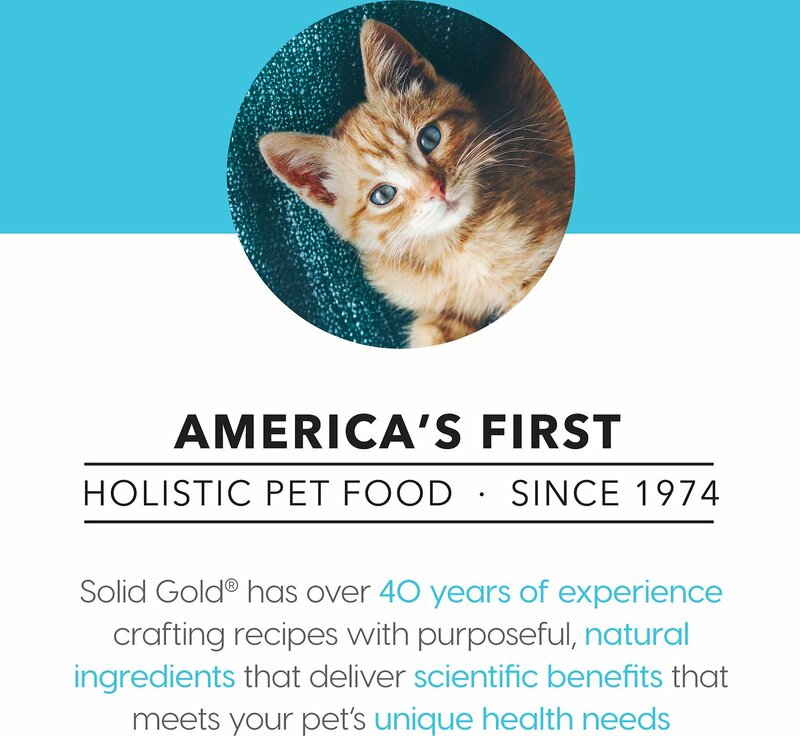 And it is good for all life stages so I don't need to worry about their baby cat nutrition. Yum!! My boys wouldn’t even touch it, maybe they’re just picky but my yard cats wouldn’t eat it either. Four cats, none of them would eat it. Thought it would be alternative to coconut milk but did not make muster. Is light, just like regular mousse, so probably great for elderly cats or those with poor teeth. I have a senior cat who just had all her teeth removed and after her gums healed she would not eat hard food. She really likes this food and eats 4 time a day. My kitten just loves this food. He is a special needs kitten who is fed via syringe and he prefers the goats milk and chicken mousse then the other brands we have tried. But my Cats wouldn't eat it by its self I had to mix it up with other cat food to make them eat it. i was hopeful for this food, but it did not work out. cats love the solid gold five oceans, so i want to try some other flavors. This food did not look good, it was kind of gray, and none of the 4 cats will touch it. so i will not buy this one again, but will defiantly keep ordering the Five oceans flavor.